The internet auction sites have lured me into buying more railway postcards. 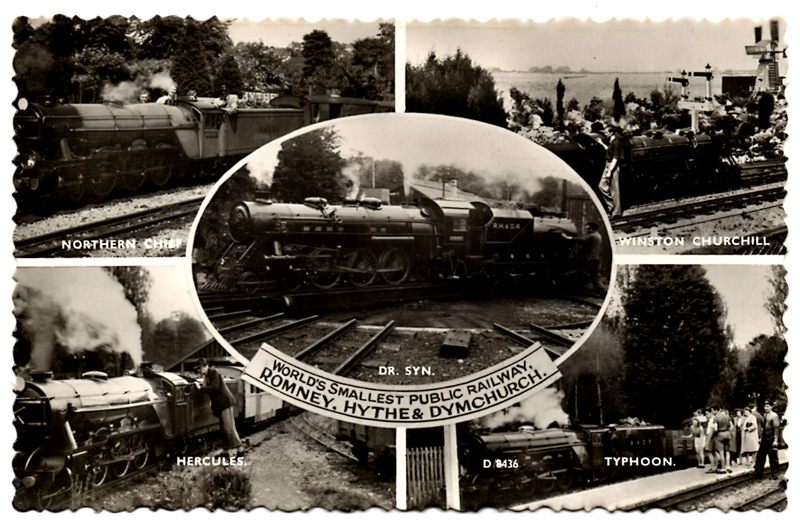 I am very pleased with these four cards of Romney, Hythe and Dymchurch Railway locomotives. What I like about them is that they are straightforward photographs of good looking locomotives. 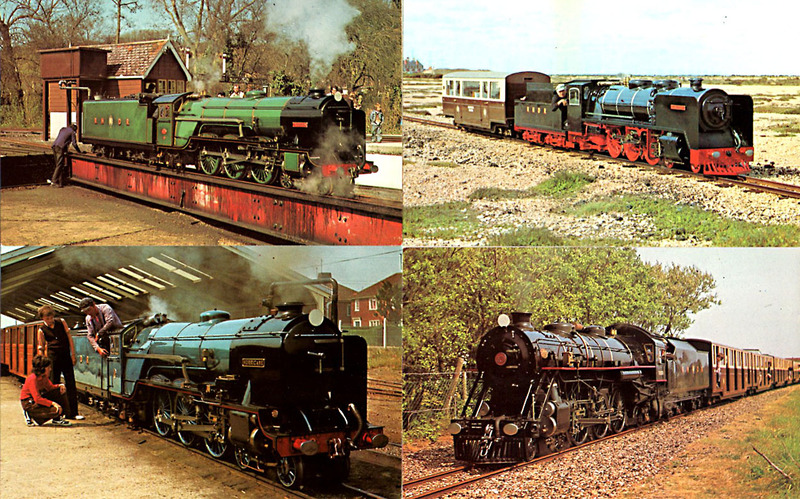 From the top left, clockwise: Typhoon, Black Prince, Dr Syn and Hurricane. They capture different locations on the railway: the turntable at Hythe, the shingle near Dungeness and New Romney station. I think the coach being pulled by Black Prince is now called the Royal Saloon. It’s very attractive. Can you hear it whispering ‘Model me….’ ? While I was browsing online I came across this older postcard of the RH&DR. I like the black and white images and the wavy edge, but what drew me to it was the centre picture of Dr Syn with a Vanderbilt tender. The two Canadian outline locos on the RHDR were supplied in 1931 with Vanderbilt tenders equiped with vacuum-operated water scoops! Apparently, the management were considering installing water troughs near Greatstone. It’s a pity they didn’t, it would be fascinating to see a 15 inch gauge loco taking on water on the move. The Vanderbilt tenders were prone to leaking and were replaced on both locos in the early 1960s. While I’m slightly disappointed we wont see them take water while in motion, I think both locos look better with conventional tenders. I can understand you being attracted to those postcards. I had to look twice as I thought they were standard gauge! I didn’t know about the water scoops. Now that would have been spectacular.